Yes, Sookie the one-eyed Bichon is licking her chops! I knew the February Daring Bakers Challenge would be chocolate, I mean Valentine's Day and all. But, for some strange reason, I am not a chocoholic like I was in my 30's, 20's well pretty much always. Now don't get me wrong, a piece of bittersweet chocolate is the perfect dessert for me. Thanks to my friend Harriette I am all over NoKA chocolates (tamborina to be exact). But I can pass the double chocolate hot fudge sundae, the death by chocolate, the chocolate torte. 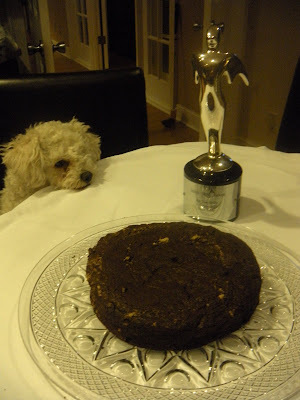 But I forged ahead, and made the Daring Baker's Chocolate Valentino, but this was not my favorite challenge. I wasn't home Valentine's weekend, so I needed another event for something this rich, The Academy Awards! It was ideal. And because this is a 3 ingredient recipe, doesn't get any easier than this. Not exactly a rendering of the food pyramid. The quickie directions: Melt chocolate and butter over double boiler. Let cool a bit. Whip egg whites until stiff. Mix yolks well and add cooled chocolate, fold in whites. Pour into buttered pan. Bake at 375 until the center tests at 140 degrees. Cool on rack. Of course I used Guittard Chocolate, I still have about 11 pounds left (I bought another 10 pound bar!). I like that there is no sugar, it tasted exactly like my Guittard. We cut into the cake when it was warm from the oven. You can see specks of egg whites, but a sprinkling of powdered sugar would have disguised it, but the taste was not affected. Not having the extra time, I bought ice cream, I know, shame, shame. But the ice cream melted and a squirt of whipped cream, it was damn good. 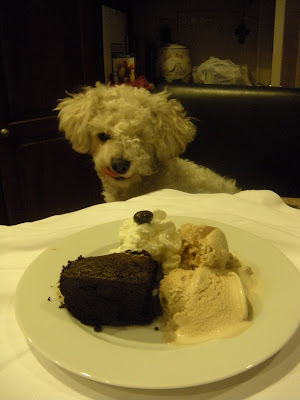 Sookie, the one-eyed-Bichon was sooooo enamored by the aroma, she would not leave the kitchen! And yes, that is my Oscar (okay, it's a Telly Award) in my picture. And a side note, this cake is rockin' good cold! Oh please, please, please let next month's Daring Baker's Challenge involve yeast! I've collected autographs from a young age. It started with an autograph book that everyone at grade school would sign (we didn't have yearbooks until high school). As I got older I would grab an autograph on whatever I had. Harry Caray on a napkin when I met him in a bar (where else? ), Little Oscar (the Oscar Meyer "little person")on a Walt Disney World menu circa 1974,programs from PGA tournaments, NCAA tournaments and all sorts of sporting events. After I got married, my husband became sort of obsessed with signed objects. Pete Rose will never be in the Hall of Fame, does that make a signed ball more or less valuable? Baseball bats, home plate, golf balls, baseballs, footballs, helmets, jerseys. But seriously, who falls faster off the popularity scale than an athlete. One arrest, one bad season, one life changing injury. It all becomes nothing more than clutter. I, on the other hand like culinary autographs. I'll never get Julia or James, and wouldn't pay out the wazoo for one for fear it would be a fake. I would have loved Richard Sax as I have almost all of his books. 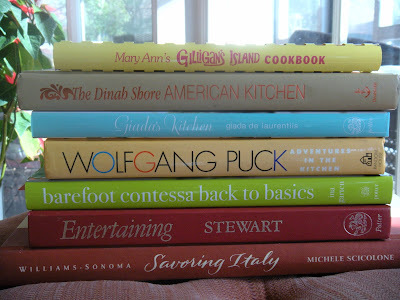 Jacques Pepin, Tom Colicchio, and Anthony Bourdain are on my current chef wish list to add to my small but nice collection. My dad was a grocer and over the years we were very lucky with the people we met and places we would go. In 1985 when I was planning my wedding, no one in Iowa knew who Martha Stewart was. I was introduced to her work by my florist who raved about her first book, Entertaining. I found it at the library and read it cover to cover. I rechecked that book out as I planned our wedding, and my cake can be found on page 269. Just after the wedding, my parents were at an event at a California winery, and Martha was a speaker. My mom bought a book and had it signed for me. Somewhere in the course of that day, somebody took it. 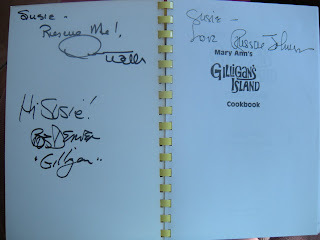 (If you have that book inscribed to Susie, it could be mine!) 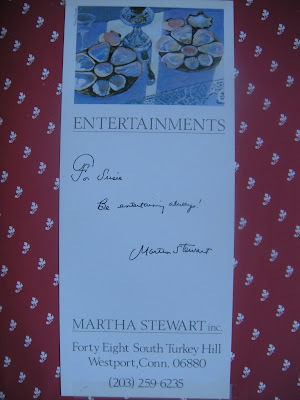 When word got back to the hosts, they sent my mom another book and a hand written card from Martha to me, it says "For Susie, Be entertaining always! Martha Stewart". I taped it to the front of my book, and a collection was born. 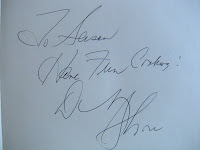 The next book was also from an event my parents attended, this one hosted by Dinah Shore. Now very few people younger than me know who she is, but I was a big fan of the afternoon talk shows in the summer. I would sit on our huge screened in porch and watch Merv Griffin and Phil Donahue. Back then it was entertainment, not reality TV, and Dinah was a frequent guest of Merv's. 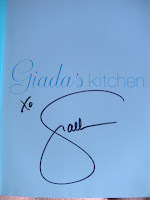 She signed her book, American Kitchen, "To Susie, Have Fun Cooking! Dinah Shore". She was really part of old Hollywood and her recipes are dotted with little stories from her life. She was 70 when the book was published. In the winter of 1994, Christina was a baby, Nic just a toddler, and we would spend a few weeks in the winter in Florida. One weekend I spotted a Shipwreck Party at a restaurant in Pass-a-Grille called the Hurricane. I dragged both kids and my parents, and met the cast of Gilligan's Island. I have seen every episode at least 3 times as it was a year round staple, every day 3:30. We used to play Gilligan's Island in the woods behind our house, what fun to be shipwrecked! They were there selling Mary Ann's Gilligan's Island Cookbook. Bob Denver (Gilligan), Dawn Wells (Mary Ann) and Russell Johnson (the professor) were there to sign. I bought one for my childhood best friend Barb Lingle, because she was most likely the one I watched every episode with and my high school best friend, Mary Beth, because it really was a part of all of our childhoods. This book isn't a culinary classic, but it is full of trivia, pictures, episode guide and, count 'em, 13 recipes for coconut cream pie! One of my next books came from a real culinary icon. Chuck Williams. Many people know little about the man that founded my place of employment. He had a hardware store in Sonoma, CA and after a trip to France, he was enlightened much like Julia Child. He began to sell French copper cookware in his hardware store. As his product lines grew, so did his store, and the rest is retail history. I met Mr. Williams at the Williams Sonoma in Las Vegas in 1999. I was out there for my dad's 60th birthday, and popped my head in the store looking for someone I knew that had transferred to that store. I had only been working for the company a few years, and he couldn't have been nicer to me. There was no customers in the store, and I'm not exactly sure why he was there. 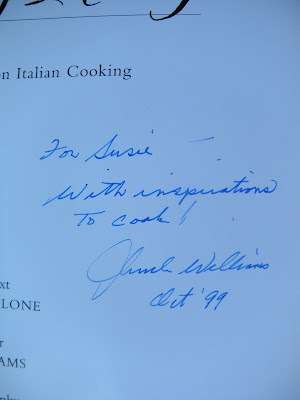 I bought a book called Williams Sonoma Savoring Italy, and he signed it "For Susie, with inspiration to cook! Chuck Williams". He is a testament to living right. He is now into his 90's and has spent his life eating great food and drinking good wine. It has been my pleasure to work for him for the last 11+ years, I look forward to many more! The last 3 are what you might consider television personalities. Ina, Giada and Wolfgang. Ina and Giada are being handled by corporations and networks. Their signings (in my experience) have rules. No personalization, no photos (although that rule was bent for the hundreds of people who complained), and because of their enormous popularity, you wait hours for a hello, sign and go. 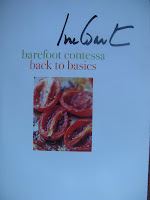 But hey, Back to Basics by Ina Garten and Giada's Kitchen by Giada de Laurentis are great cookbooks, and the autograph is just an added bonus! Wolfgang Puck was one of the earlier celebrity television chefs. I would read about him in the cooking magazines and see clips of him on TV. When I would go to Los Angeles to visit my sister she would humor me and take me to the Wolfie restaurants: Chinois on Main, Spago, Granita and Postrio. I never saw the master at work however, but of course Scott, who runs smack into celebrities all the time (honest) was at Postrio and meets him. He introduces himself, chats up Wolfie and gets me a book. 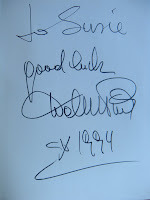 Adventures in the Kitchen, signed "to Susie, good luck, Wolfgang Puck". To be honest, I did travel across the country for Ina and Giada, but I don't really hunt these things out.I simply take advantage of signings when they come. Williams Sonoma in Saddle Creek is hosting a book signing by a Birmingham author and restaurateur, Frank Stitt. I am most impressed that he was on the PBS series, Great Chefs, I loved the program and its easy flow. He is most noted recently, however for Highlands Bar and Grill in Birmingham where he is famous for his French cuisine and he recently opened Bottega which focuses more on the Italian cuisines. He was just announced as a finalist for the 2009 James Beard Awards and has been featured in Southern Living. 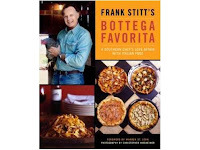 He will be signing his book Bottega Favorita, A Southern Chef's Love for Italian Food, Thursday Feb. 26, between 1-3pm. The book must be purchased at Williams Sonoma for the signing. Of course I will attend and blog! The following is from the local paper The Commercial Appeal. I was dumbstruck. The older woman who spewed this drivel is shown setting a table with gold candlesticks and white tapers (it isn't 1985 anymore) and the table is dressed in a bedspread and chiffon scarf. I can't make this garbage up! Needless to say after 4 cups of java I fired off a letter to the editor. This is personal! There's entertaining, and then there's Southern entertaining. "There's definitely a major difference," said Sally Shy, longtime socialite, former president of Memphis in May International Festival and owner of a local event-planning company. "The Northern form of entertaining is more formal, not as loquacious and vivacious and filled with joie de vivre as it is in the South," said Shy. "Here, we go out of the way to make people comfortable. They're far more reserved in the North. Ahhhhh. I am too bothered to comment further. I need to go for a walk! Aunt Molly was tall, that I remember. We went to her home on a few occasions, but she visited us only once to my recollection, but what a visit. She prowled around our woods one afternoon and brought in these leafy plants, they resembled a rhubarb, but weren't red. I know now they are in the thistle family, and called cardoons. She stripped the leaves and trimmed the woody stems, sort of like you would trim celery, peeling the stringy outsides off. Then she cut them into 4" pieces and dipped them in egg, then flour and fried them. They were wonderful. I don't think I ever had them again. I tried unsuccessfully to plant thistle here in Memphis, but to no avail. Cardoons are just a memory. However, on that same visit, Aunt Molly baked cookies. I didn't watch her do this, but remember the sweet crunch of these cookies. They were unlike anything I had ever eaten. They were a little complicated for me as a 12 year old, but my mom would make them pretty often, and we fondly called them Aunt Molly Cookies. Many years later when I was a student in Boulder, I walked into this small shop and there was a huge jar on the counter filled with Aunt Molly Cookies. I couldn't believe it. They called them Biscotti, I had never heard them referred to as that. So I shelled out $2 for nothing but disappointment. When my weekly phone call home rolled around I told my mom about them, what they were called and how awful they were. So here we are many years later, and I am baking Aunt Molly Cookies. The aged recipe is written in her handwriting which is as tall and perfect as she was. I do it a few times a year, and this time I decided to try a few changes. The original recipe follows, with my little changes. I tried both batches with the addition of rice flour. King Arthur has a biscotti cookie mix that Lori sent me and it is so good, I tried to figure out how to make them ourselves. The only odd ingredient was rice flour and I assumed it was to make the crumb a little more delicate and crunchy. I like the taste of Aunt Molly's, but I had a hard time getting that crunch. I also used the grocery brand of Anise extract and used a half teaspoon. It wasn't enough for that pronounced flavor I love. The traditional needed a full teaspoon on anise extract. I have in the past used Pure Anise Oil, in which case a little dab will do ya. It is way too potent, and one drop too much is like mouthwash. I have seen recipes that use Sambucca for that anise flavor, but I think the extract works well. The second batch I made I substituted the white sugar and added brown sugar. There is a cookie called Biscoff, if you fly Delta you know what I'm talking about. I decided brown sugar is what gives those little jewels their crunch and flavor, so I skipped the anise and added vanilla. Both results were delicious. 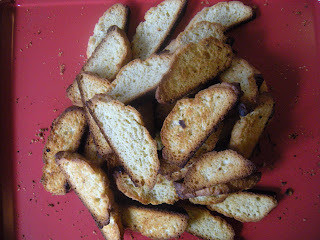 The biscotti made with only brown sugar looked no different than the originals, but perhaps a little sweeter. I have slowly started replacing my insulated cookie sheets that I have used for 12 years. The traditional sheets I bought cook much faster and the bottoms get brown very quickly on lower racks. So I have a little relearning to do. I think I would like the first baking on the insulated sheet, and the second baking on the traditional sheets so they brown nicely. This same recipe runs on Epicurious.com, but has twice the amount of butter which would make them more of a cookie designed for the American palate. Cream butter, add sugar and then eggs. Add sifted dry ingredients. 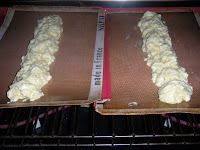 Roll dough into 2 long logs and bake at 370 until light brown. About 20-25 minutes. Allow to cool on rack about 10 minutes and then slice into 1/4" slices on the diagonal and bake about 5 minutes on each side to crisp them. We are a house divided. Mayonnaise (me and Christina) or Miracle Whip (Scott and Nic). Never the 2 shall meet. I say the Whip is too sweet, the boys say mayo is too creamy. Let's face it, it is rare for anyone to cross that line. But I have Miracle Whip on the shopping list for a new reason. The Miracle Whip facial! There's nothing new about using kitchen ingredients for beauty. I have rinsed my hair in vinegar many times,tried the egg white facial mask, olive oil hand conditioner, mayonnaise as a hair conditioner, even brushed my teeth with strawberries once. You have to throw away the toothbrush because of all those little seeds, I don't even remember why I did it. Anyway, this week I came across a news bit in a magazine praising the benefits of the Miracle Whip facial. So naturally, I googled it and found some really interesting posts. The best is here. The original post was put up March 2006, and the most recent comment (mine) is Feb. 8, 2009. So here's the deal, slather Miracle Whip all over your face, avoiding the eye area. Some readers also put it on their lips, most mayo eaters will opt out of that. Relax for 20 minutes, do not breathe deeply, because it stinks like Grandma's macaroni salad. After 20 minutes, wipe gently with a dry washcloth and then rinse and wipe your face clean with warm water. People were amazed at the dead skin coming off their face. I didn't have layers of skin come off, but after drying my face, there was a little "zingy" feeling, probably from the vinegar, but my skin was as smooth and soft as a babies. Amazingly smooth. Really. So I'm doing it again tonight, and every night for a week. I can't wait to see what happens. I'll either look like a 21 year old, or my face will be covered in pimples. I'm also thinking of putting it on my extremely dry feet, I'll let you know how miraculous that is. Post Script: January 2010. I kept up the facial for a solid week. I never really got accustomed to the stink, but every night my face was so smooth, crazy smooth. Toward the end of the week however, my skin was a little sensitive which is one adjective I never use to describe my hide. I think the best way to do this is maybe every other night, and then just maintenance. Sounds rather invigorating now, 11 months later, I just may raid the fridge tonight. Happy New Year! There's nothing like a cold snap to get the soup simmering. 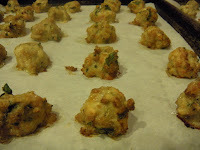 At Thanksgiving I made The Barefoot Contessa's Italian Wedding Soup, and it was delish. So I decided to go for it again, with a few changes, of course. Tonight, I made the meatballs. Now I appreciate what goes in to making these recipes user friendly, but when it calls for 3/4 lb. ground chicken and I buy it in a prepackaged 1lb. package, you have to make some changes. So the recipe that follows is my version. It's just a little easier to use up what you buy, right? The meatballs are kinda dangerous though. They smell fabulous, cook quickly and you can pop 'em in your mouth without even really thinking about it. Which is why I always fight my weight, I never think about those things! he chicken sausage I use is links from the Fresh Market, they are yummy, and easy to slip the casings off. And the recipe calls for 2 kinds of cheese. 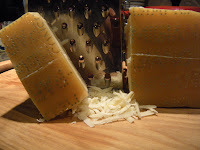 I buy my Parmesan Reggiano by the 5# wedge, so why would I deviate from that? I also like to shred it with the bigger holes of the grater rather than the fine powdery grate. I want to taste the most expensive ingredient after all! So combine the mixture and use a small 1" scoop so your meatballs are uniform and line your baking sheets with parchment so clean up is a snap! The original recipe says it makes 40, my version which really isn't a double makes 90. So plenty for the soup, and a few to freeze for a quick pasta. Also, after a day in the fridge, you'll find the tortellini soak up a good amount of the broth, so have extra on hand to keep the soup, well,soupy! Of course no soup should be without something to mop up the sauce. So I went back to the bread recipes and did some tweaking. Watch for the next post on the bread success and failures. Combine and drop. Bake at 350 for 15-20 minutes. You better eat one to make sure they are done. Cool and chill until you are ready to make soup. They also freeze beautifully. At least a half hour before dinner, start the soup. You begin with the aromatics. Celery, carrots and onions sauteed in a little olive oil. You don't want to brown them, but sweat them so they release their flavors. You then add the stock and white wine. I usually do this step early and let the broth simmer with the veggies for a few hours. The broth will reduce, and I then pop the lid on after an hour. The veggies get soft and the flavors really marry. 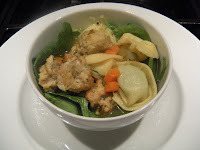 Bring the soup to a boil before you add the tortellini, and when they have cooked, add the dill and meatballs. I like more spinach than the rest of my family, so I generally put a handful in the bottom of my bowl, and then ladle the soup over it. Wonderful! I never season my soup with salt if I use canned broth, and I prefer my pepper fresh ground on the top. A glass of wine, a hunk of bread, dinner is served. Healthy, light, delicious.